Contactors and relays are two closely related terms. Both of them are electrically operated switches used for control and switching of loads. Contactors and relays have similar construction. Both have an external envelope to protect all the internal parts from the external environment. An electromagnetic coil is provided for opening and closing of contacts. The contacts are opened and closed by exciting this electromagnetic coil. 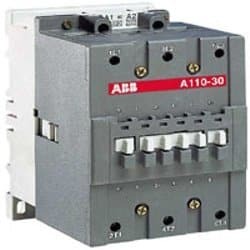 A Contactor is used for switching of motors, capacitors, lights etc, that drains very high current. It has at least a single pair of three phase input and output contacts. It would be normally open. Some contactors come with additional auxiliary contacts that may be either NO or NC. These auxiliary contacts get activated along with the main contacts. Switching is achieved by energization and De-energization of the contactor coils. Contactors are chosen upon the ampere ratings of the load. Contactors require an additional supply (either AC or DC depending upon the type of contactor we use) for excitation. It is used for power switching. A relay consists of at least two contacts and an excitation coil. These contacts may be normally open or normally closed. These contacts are closed or opened by exciting the coil. Relays are used for switching of control circuits and cannot be used for power switching with relatively higher ampacity. It can be used for switching of small lights, sirens, indication lamps etc. Mainly used in control and automation circuits, protection circuits and for switching small electronic circuits. Used in the switching of motors, capacitors, lights etc. Consists of at least two NO/NC contacts Consists of a minimum one set of three phase power contacts and in some cases additional auxiliary contacts are also provided. 2. 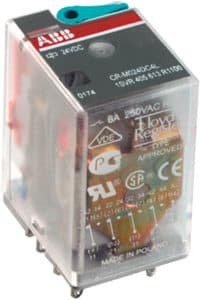 Where are contactors used and where are relays used?